Cars don’t just have to be for getting from point A to point B or a way to get your groceries home, they can also be fun! The feeling of g-force grabbing hold of you as you press the gas, the turn-on-a-dime precision steering, these are the things that can make even a trip to the dentist seem exciting. BMW may be known more for luxury cars than sports cars, but that doesn’t mean we don’t have plenty to offer with that added thrill. If you’re looking for style, the BMW Z4 is your answer. With it’s elegant, curvy body and powerful looking wide front end, you’re sure to catch everyone’s attention. It’s also equipped with a retractable hard top roof, available in contrasting colours. It’s just one more way to help you stand out from the crowd. Looks can only take you so far, however. Yeah, it’s nice to look great while putting around town or cruising down the highway, but the driving experience is where the Z4 truly shines. Touting a 3.0 litre 6-cylender engine and packing 335 horsepower, the Z4 will make you forget about everything except for the heart pounding ride from the second of ignition until reaching your destination. You might even catch yourself taking the long way just so you don’t have to end the journey. It’s understandable, we won’t hold it against you. It’s one of the most fun sports cars out there. The BMW M series is well known for the high performance sports cars in it’s lineup, and the M6 is sitting proudly on top. It comes equips standard with a 3.5 litre V8 engine and rockets off of the starting line to reach 100 miles per hour in just 4.2 seconds. It boasts 560 horsepower without upgrades but can be increased to a staggering 600hp with the competition package, which also shaves another tenth of a second off of it’s 0-100 time, bringing it down to 4.1 seconds. 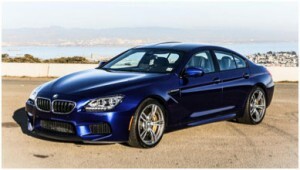 The M6 2-door is available in coupe and convertible styles and it’s also available in a 4-door gran coupe, the latter of which provides a still-impressive 4.4 second 0-100. Whoever came up with the phrase “stop and smell the roses” surely has never driven a BMW sports car. Once you’re moving the last thing you want to do is stop. Besides, you could always get a rose scented car freshener and have the best of both worlds. Come down to Budds’ BMW Hamilton fast for your next sports car, and leave even faster.